The day before you need the drinks, make a batch of simple syrup by combining one cup each of sugar and water in a sauce pan, and bringing it to a boil over medium heat until sugar is dissolved. Cut the heat and let it cool. Rinse a bunch of mint and pluck the leaves. Take the cooled — or mostly cooled — syrup and pack it with mint leaves plucked from their stems. The stems can add woody, soapy flavors, so take the extra time to pluck. Leave the syrup and mint in a jar in the fridge overnight. The ratio of mint syrup to bourbon is largely up to you and depends, on how sweet you like your drink. I’m going with 3 ounces of bourbon to 1 ounce of syrup. Which means that one cup of minted simple syrup is enough for a 750 ml bottle of bourbon. Strain a cup of mint syrup into a carafe and pour in a bottle of bourbon, give it a stir. (If you need it to be portable, buy a liter bottle of bourbon, fill up a flask and then fill the bottle back up with the mint syrup.) Then have crushed ice on hand, and keep a bunch of mint in a glass for garnish. 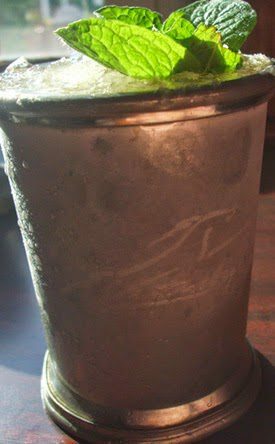 Scoop ice into a glass; pour julep mixture over; garnish with mint, and then enjoy!